Dr. Nash has been at Intel since October 2005, and focuses in the area of Enterprise and High Performance Computing in the Datacenter group. He is currently the Senior Director for Worldwide Technical Computing Solutions and Sales, and in this role is responsible for managing all solutions and sales to meet Technical Computing Revenue goals for the Enterprise and Government segment. Previously he was the strategic lead for Intel® QuickAssist Technology based accelerators in HPC and a WWW Consortium Advisory Committee representative. 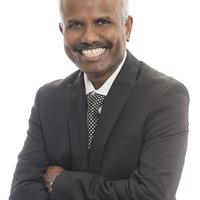 Prior to Intel he has held the roles of Director of System Architecture at Conformative Systems, CTO/VP of Engineering at MSU Devices, and Director of Java Program Office and Wireless Software Strategy at Motorola, Inc.
Dr. Palaniswamy holds a B.S. in Electronics and Communications Engineering from Anna University (Chennai, India) and a M.S. and Ph.D. from the University of Cincinnati in Electrical and Computer Engineering.